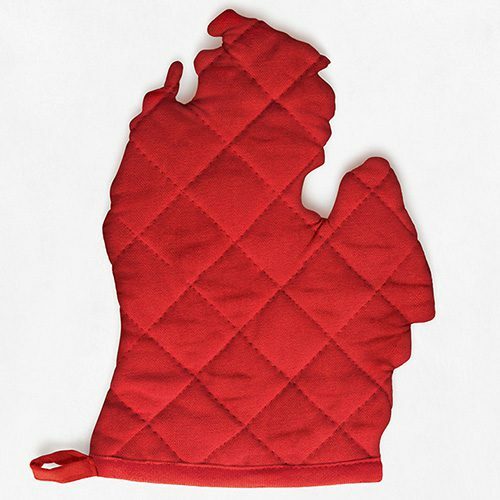 Do you ever wish you had a personal chef to cook dinner for you every night? I sure do! Meal planning, prepping, and cooking can be a tiresome chore, especially on weeknights. Evan and I try to plan accordingly: faster, easier meals during the week while saving more time-consuming meals for the weekends. One of our new favorite go-to weekday meals is a savory take on chicken salad sandwiches. No grapes, raisins, or nuts here! Celery, tarragon, and lemon juice give this recipe a delicious tangy flavor with a hint of anise. 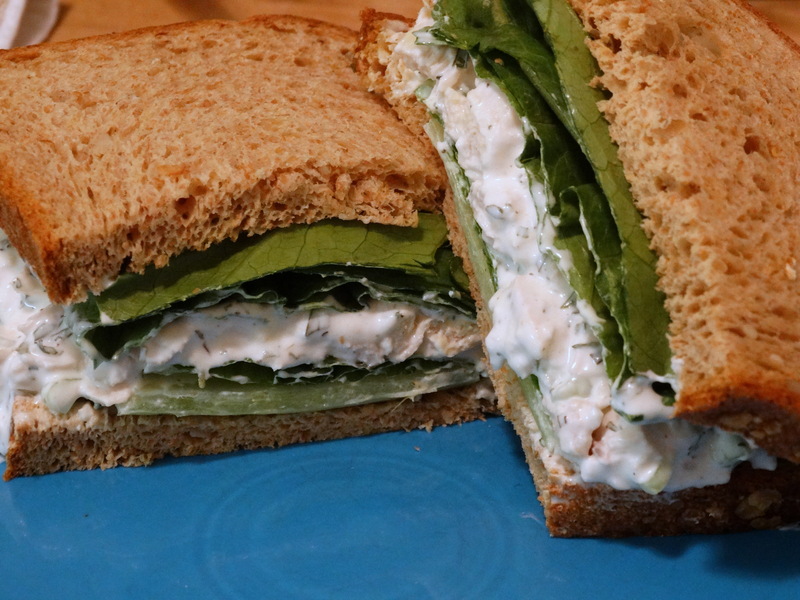 You will need boneless skinless chicken breasts, celery, canola mayo, Greek yogurt, tarragon, freshly squeezed lemon juice, pepper, lettuce, and bread. Begin by trimming any fat from two boneless skinless chicken breasts and cutting them into large chunks. Place them in a large sauce pan, covering them with water by at least two inches. Bring the pan to a low simmer for about 30 minutes. 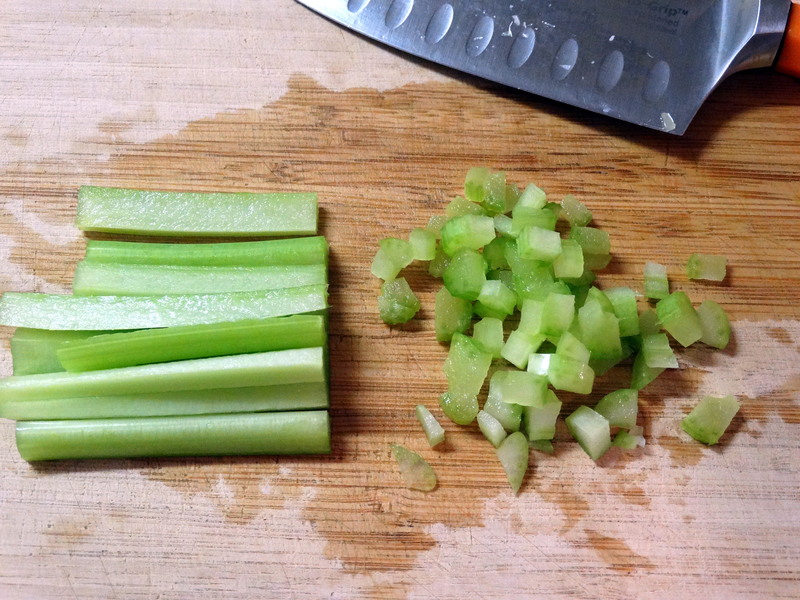 While the chicken is cooking, finely chop 1/3 cup celery. 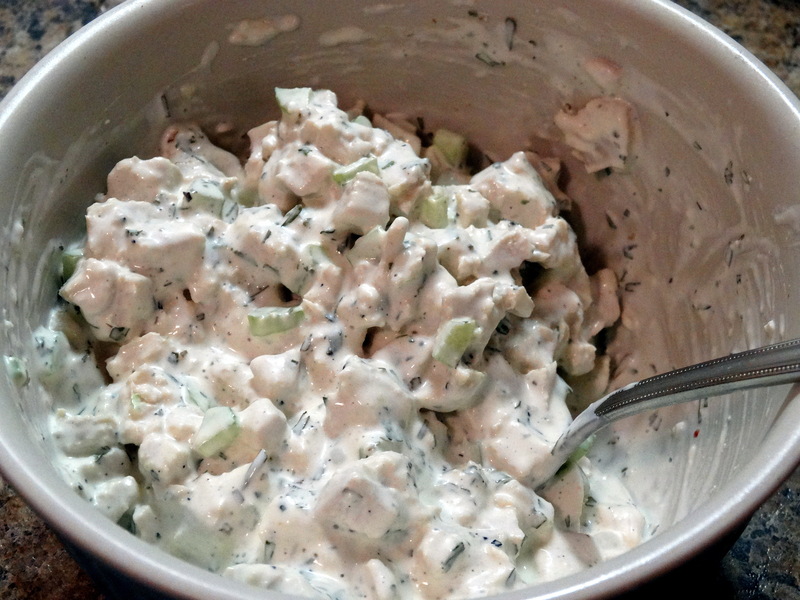 In a small mixing bowl, combine the celery, 1/2 cup canola mayo, 1/4 cup Greek yogurt, 1 tablespoon dried (or 3 tablespoons freshly chopped) tarragon, 2 tablespoons freshly squeezed lemon juice and 1/2 teaspoon freshly ground black pepper. Stir to combine and put your sauce in the refrigerator until you are ready to add the chicken. Once the chicken is cooked through, drain off the hot water and fill the pan with cold water, setting it aside until the chicken is cool enough to handle. 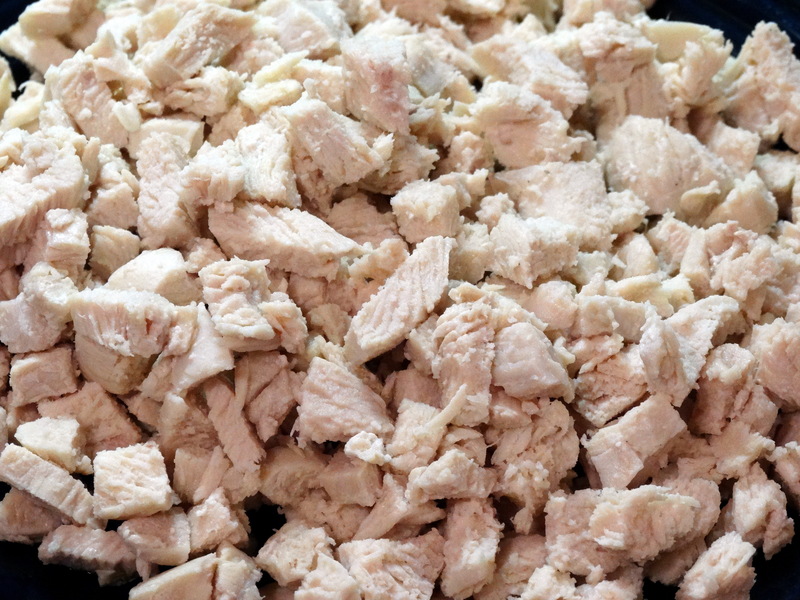 When ready, chop or shred the chicken pieces to your desired size. I like to chop mine into cubes that are approximately 1 centimeter square. Stir the chicken into the sauce until evenly coated. Divide the chicken salad onto four slices of bread with lettuce. Add more lettuce and top each with a second slice of bread. That’s it! You’ve got yourself a perfect chicken salad sandwich. Enjoy! 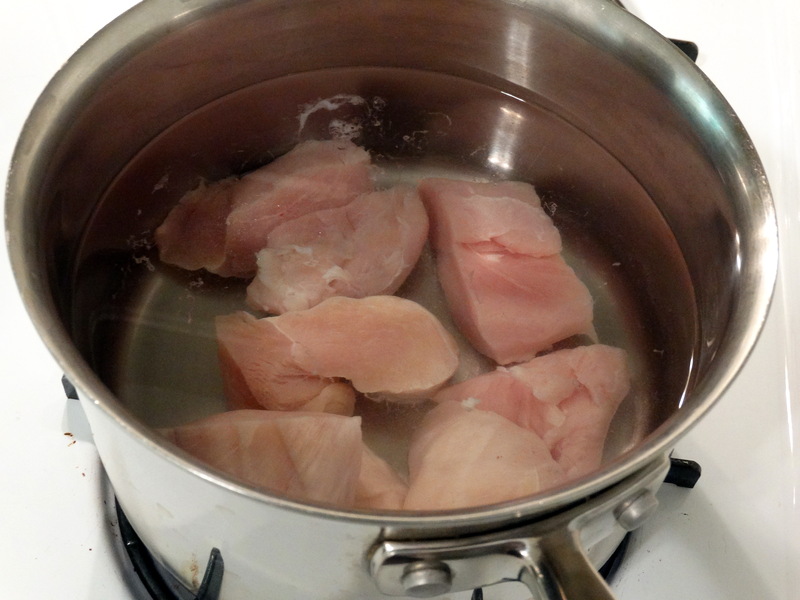 1) Begin by trimming any fat from two boneless skinless chicken breasts and cutting them into large chunks. Place them in a large sauce pan, covering them with water by at least two inches. Bring the pan to a low simmer for about 30 minutes. 2) While the chicken is cooking, finely chop 1/3 cup celery. 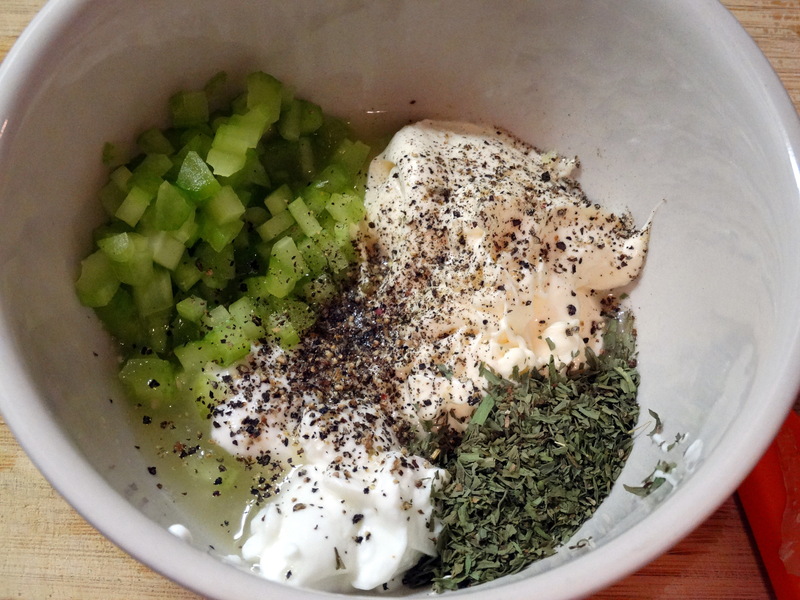 In a small mixing bowl, combine the celery, 1/2 cup canola mayo, 1/4 cup Greek yogurt, 1 tablespoon dried (or 3 tablespoons freshly chopped) tarragon, 2 tablespoons freshly squeezed lemon juice and 1/2 teaspoon freshly ground black pepper. Stir to combine and put your sauce in the refrigerator until you are ready to add the chicken. 3) Once the chicken is cooked through, drain off the hot water and fill the pan with cold water, setting it aside until the chicken is cool enough to handle. When ready, chop or shred the chicken pieces to your desired size. Stir the chicken into the sauce until evenly coated. Divide the chicken salad onto four slices of bread with lettuce. Add more lettuce and top each with a second slice of bread. *Adapted from Cooking Light Magazine. Sounds delicious! The weather is really warming up here in Australia as we move into summer, so chilled chicken salad sandwiches sounds divine. This is such a great alternative to an all mayo recipe. Thank you for the delicious contribution Marta.